A military service is a desired profession for those who want to serve their country in any possible job. Everyone cannot join the army as a soldier as they have tough criteria. But if you really want to set your career in the army, you can apply for other jobs in the department. In the army, you can serve as the doctor, engineer and in many other fields as well. The military department offers good starting salaries with other benefits which civilians cannot enjoy usually. 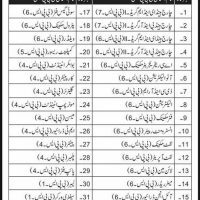 Recently Military engineering service Rawalpindi has announced several seats in different departments. If you want to have a respectable job but are not qualified enough or doesn’t have a high-level degree, then you should not miss this chance. Skilled candidates can apply for the jobs who have enough experience. But to apply for all the posts you should be physically and mentally fit. Different posts are available in different regions. These recruitments will be in different cities like Karachi, Lahore, Quetta, Peshawar, Mangla, Rawalpindi, Gujranwala, and Bahawalpur. Complete procedure to apply and other essential details regarding advertisement are given below. You can download the application form from the official website of engineering service www.mes.gov.pk. 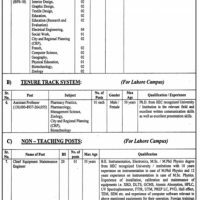 All application should reach Office of Relevant Region Additional Chief Engineer (ACE) with attested copies of all educational certificates, domicile, CNIC and two photographs. With application form, you are also required to attach the bank challan or draft of Rs 100. The last deadline for submission form is 10 October 2018. All compulsory data you will find in the advertisement regarding the job which is published in the post can be sent to the related regional office. Only male applicants can apply for these jobs. No TA/DA will be granted to any individual. All posts will be on worth based. Applicant pay scale will be from BPS-1 to BPS-7. The fee to apply for all the posts is Rs 100. Mention the post clearly on the envelope. Bank challan should be in favor of E-in-C’s Branch, GHQ Rawalpindi. Incomplete application forms or applications after the due date will not be acceptable. Take original particulars at the time of interview. Jobs in MES are a great opportunity for those individuals who don’t have a degree. You can find the complete information about the posts in the given advertisement. Apply before the closing date or you will miss this great opportunity.